Capri, an island is situated in the Tyrrhenian Sea off the Sorrentine Peninsula, on the southern side of the Gulf of Naples in Campania region of Italy. Capri, the main town has been a resort since the Roman Republic till present times. Capri is known in the Greek mythology as the isle of the sirens and was a favoured resort of the Roman emperors. The interesting features of this island are the Marina Piccola which is the small harbour, the Belvedere of Tragara, a high panoramic promenade which is lined with villas, the limestone crags known as sea stacks which projects above the sea, the Faraglioni, the town of Anacapri, the Grotta Azzura – Blue Grotto and the ruins of the Imperial Roman villas. It is a part of the Campania, Province of Naples, region and is the island’s main population centre with two harbours namely Marina Piccola and Marina Grande, the main port of the island. Anacapri, the separate commune is placed high on the hills towards the west. Faraglioni, rock formations are one of the natural wonders of the island. The Faraglioni beach is one of the most beautiful beaches with many unusual rock formations in the sea surrounding the island which includes a natural arch. Anacapri which is the highest town on the island has amazing view of the harbour which is at a lower level. There is a chair lift to Mount Solaro near the central square and a street with many shops some of which offer limoncello tasting - limoncello is lemon liquor. Items made with lemon are also found in several shops with handmade sandals, ceramics as well as perfumes which are specialities of the island. Capri’s fashionable shopping street, Via Camerelle is the place where one will find exclusive luxury boutiques and fashion. Grotta Azzura, The Blue Grotto is the most amazing site of the islands’ several caves where the refraction of sunlight in the cave gives it an iridescent blue light in the water. Entry to the cave is done with the guidance of small rowboatswhich are available around the cave entrance and once inside one gets the opportunity of seeing the most spectacular sight of the blue water. 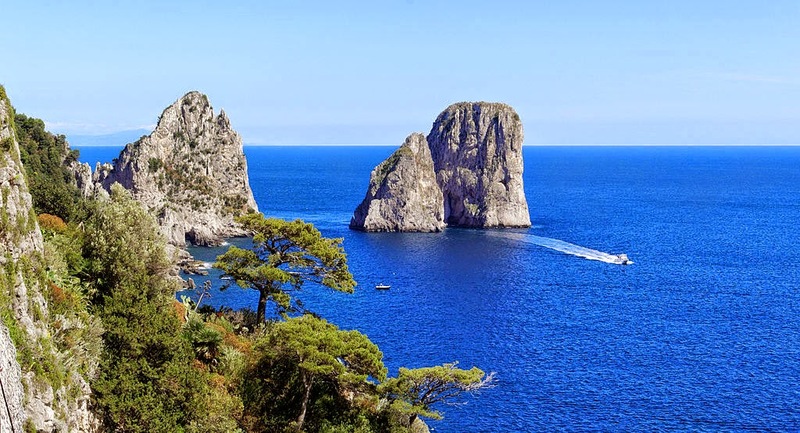 Capri is a very picturesque and an interesting island made of limestone rock. Tourist reach by boat at Marina Grande being the main harbour of the island, with beaches scattered all around the island, with only two towns, namely Capri which is above Marina Grande and Anacapri, the highest town. One will find lemon trees, birds and flowers in plenty here. The island can also be reached through frequent ferries and hydrofoils from the city of Naples as well as from Sorrento on the Amalfi Coast. One will find a range of hotels in Anacapri and Capri and though Anacapri is more peaceful at night, Capri has more nightlife being the main centre of the island. The Grand Hotel Quisisana, an exclusive hotel with a spa and baths since 1845 is one of Capri’s most excellent hotels while the luxurious Capri Palace Hotel and Spa in Anacapri is a member of the Leading Small Hotels of the World.